As the bombing campaign in Syria and Iraq intensifies, the British parliament is due to meet today to line up behind the US-led drive to reassert control over the entire Middle East. 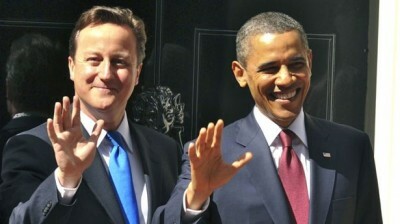 The Conservative-Liberal Democrat coalition government of Prime Minister David Cameron and the opposition Labour Party have declared their support for the vote, which comes two days after a bellicose speech by US President Barack Obama before the United Nations General Assembly. In addition to calling for support in a “generational” war in the Middle East, Obama issued provocative denunciations of Russia and threats of military action over Ukraine. On Thursday, US bombers took out additional targets in Syria, while French jets participated in campaigns in Iraq. Australia, Belgium and the Netherlands have announced that they will send planes. Also participating in the US-led coalition are a collection of Gulf monarchies, including Saudi Arabia and Qatar, the two principal financial backers of Islamic fundamentalist forces participating in the civil war targeting the regime of Syrian President Bashar Al-Assad. While the Islamic State of Iraq and Syria (ISIS) is the ostensible target, the real aim is to use ISIS as a pretext to reverse the climbdown last year, when plans to bomb Syria were derailed. Amidst divisions within the ruling class over strategy and widespread popular opposition, a resolution authorizing bombings against Syria was defeated in the British parliament in August 2013. Concern within military circles that the UK and US were unprepared for a war that would bring them into headlong collision with Russia split the Conservative Party at the time. A total of 30 Conservative MPs joined the Labour Party in voting against the resolution. The vote contributed to the decision by the Obama administration to shelve its plans. This was followed by the regime change operation in Ukraine targeting Russia earlier this year, and then the use of ISIS to line up support behind renewed military operations in both Iraq and Syria. The UK is already supplying arms to Kurdish Peshmerga fighters and using British warplanes for surveillance operations, but has so far refrained from authorising them for airstrikes. But both the Conservatives and Labour Parties back British involvement in the US-led war, aimed at reasserting military dominance in Iraq, bolstering US hegemony over the Middle East, overthrowing the Assad regime and undermining Syria’s key allies, Iran and Russia. Air strikes could begin by Saturday. No one is more eager to do that than the Labour Party. Party leader Ed Miliband told Cameron that he fully supported his position. Speaking on the BBC’s Andrew Marr show last Sunday, Miliband railed against the “murderous organisation” ISIS whose “barbaric acts not just against British people but also the Christians, Yazidis and so on shock us all” in an attempt to justify his support for war. Miliband said the situation was different from last year in that the earlier planned attack didn’t meet his criteria and there was “another way” of dealing with the chemical weapons issue. “We’ve learnt the lessons of the Iraq war—which is that military action has to be a last resort,” he insisted. In fact, the airstrikes, announced in a perfunctory three minute statement by Obama, have no legal or constitutional basis. The US Congress has not voted on them, and there has been no United Nations resolution. Within hours of the illegal airstrikes in Syria, Miliband called for an undefined resolution to be discussed at the United Nations. Miliband did not elaborate further on what the contents of the resolution should be, and Labour sources said the party was not insisting on a resolution being passed in order to support military action. But he will in all likelihood cite Wednesday’s UN Security Council resolution supporting measures targeting the flow of “foreign terrorist fighters” internationally, and which does not authorise the bombing of Syria, as adequate justification. Even the arch war criminal Tony Blair felt it necessary in 2003 to spend several weeks trying to get a binding UN resolution to cover his and President George W Bush’s planned crimes. This pretense is being dispensed with in the current operation. Any concerns that were professed last year are being brushed under the carpet, as the clamour mounts for Britain to overcome its national humiliation, take part in military operations against ISIS and reassert its position on the international stage.